It’s the only language that people feel they don’t need to learn it before they start using it. It’s also the world most misunderstood programming language. Check the notes and remarks below and come back to see the video. JS is becoming the virtual machine for the world. Used almost everywhere. It’s a language of many contrasts. It contains both the ridiculous and the sublime. When it get a compilation error, it backs up, looks around for a line feed, replace it with a semicolon and tries again. That should really freak you out. Advice: Put yourself the semicolons where they’re supposed to be. ‘eval’ is the most misused feature in the language. Dimensioning an array doesn’t exist in the language. This leads to surprising error and mistakes. Always use the triple equal operator (===). Never use the double equal operator (==). Just don’t use it. Be careful with errors that cancel each out. Avoid blockless statements and always include curly braces ! Lambdas: One of the best things to have happened to a programming language. It’s powerful, safe, smart. Dynamic Objects: You can add or remove a new property to and from an object at any time. Object literals: very nice notation to describe objects. Was the inspiration for JSON. 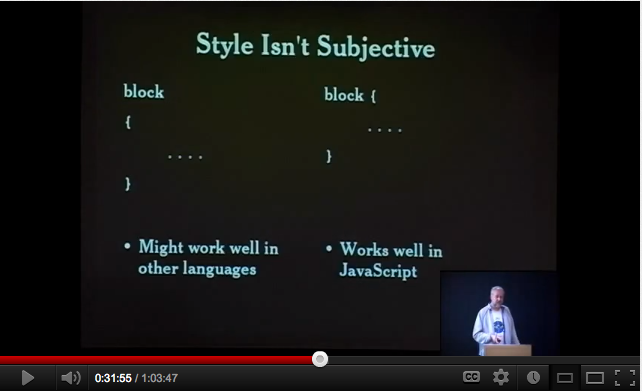 Here is another VERY good reason why Style is not subjective at all. Style is not subjective !!! 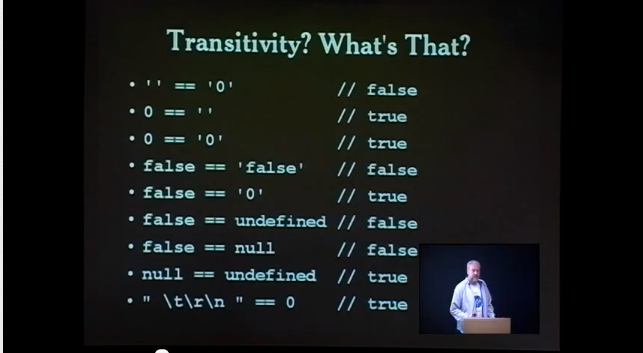 JSON became a standard because Crockford said it was. 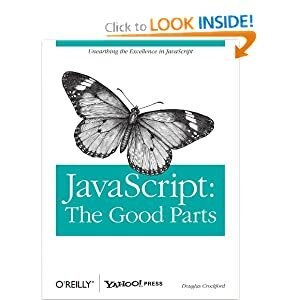 At the time, some customers didn’t want to use JSON because they saud they had committed to XML for data interchange and JSON wasn’t a widely adopted standard. Doug said it was. Ad here we are. If you haven’t done it yet, check Doug. Crockford’s book on the subject. ← Scott Hanselman introduces ASP.NET MVC2 Basics.